Unless investors get spooked today during Halloween trading, the S&P 500 Index will post its second-best month since the post-World War II era, according to a report published by GaveKal Research. The last time markets rallied so strongly, Gerald Ford had recently moved into the White House and Muhammad Ali "rumbled in the jungle" with George Foreman. A few weeks back, we noted that Citigroup's Panic/Euphoria model signaled an extremely negative sentiment level, indicating that higher equity prices should follow. Read: Can Markets Find the Road Back to Positive Territory? Other contrarian signals that can often be used as a guide when investor sentiment swings to extremes are cover stories reflecting bullish or bearish sentiment. A current example is the October 31 edition of TIME magazine, which features "The China Bubble" with a photo comparing China's economy to the delicate nature of a blown-up piece of bubble gum. In addition to the European debt crisis and the "Occupy" movement, the media has latched onto the slowdown in China. However, many contrarian investors find these types of magazine covers signal a possible attractive entry point. We've stated many times we don't believe the Chinese economy is a bubble, but that does not mean a significant slowdown wouldn't affect the global economy, especially natural resources. This is because China's economic transformation over the past few decades has cast the country into the forefront of demand. 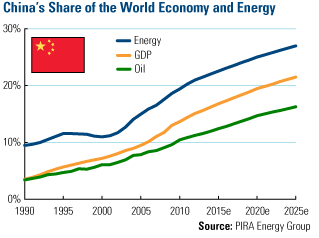 PIRA Energy Group says that, in 1990, China's share of oil and GDP was less than 5 percent; its share of world energy was just under 10 percent. Since then, China's share of energy, GDP and oil has risen dramatically, with each expected to be approximately 28 percent, 21 percent and 16 percent, respectively, by 2025. Despite the moonshot trajectory of China's 20-year growth, Bernstein Research says the country still has a lot of catching up to do to reach the level of the developed world. Take oil consumption, for example, where China's consumption of 2.5 barrels per capita in 2010 is still very low compared with the 22.1 barrels per capita that the U.S. consumed. Bernstein estimates the growth in consumption will increase to 3.6 barrels per capita in 2020, this amount is only a fraction of the consumption in the U.S. and half of Europe's. Looking out over the next five years, a portion of China's oil demand will come from transportation fuels. Bernstein thinks the country is at an "inflexion point" and the demand for cars and the fuels necessary to make them go should grow "more quickly than GDP." During the last 10 years, the number of vehicles has grown at an annual rate of 17 percent, and since 2007, more new vehicles are on the roads than "put on to the roads over the [previous] 30 years," states Bernstein. Although car sales have slowed in recent months because of the government's monetary tightening policies and the ending of a stimulus program for car buyers, the long-term desire for auto-mobility remains. 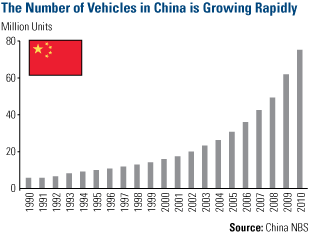 Bernstein expects the number of vehicles to double in China, from 78 million to 155 million units over the next five years. While demand in China plays catch-up to the developed world, developed world companies are tapping this resource to find growth. These are companies such as Caterpillar, which reported a "record-breaking third quarter" this week, with sales and revenues increasing in every part of the world. Most notably, the industrial bellwether saw a 38-percent jump in sales and revenues in the Asia-Pacific region. During the company's conference call, CEO Doug Oberhelman said that he supported the actions taken by the Chinese authorities to slow its economy. In his view, this was "the best thing that could have happened to the construction equipment industry." He thought China was previously growing at an unsustainable pace, and now this slowdown is "extremely healthy" in the long-term, he added. Health can be a relative term when comparing equities. Right now, China appears to be a "healthy" place to invest compared to U.S. stocks. 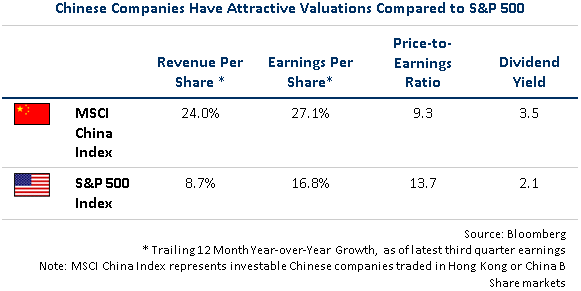 Bloomberg data shows that companies in the MSCI China Index had a higher revenue per share, a higher earnings per share, a higher dividend yield and a lower price-to-earnings ratio than the stocks in the S&P 500 Index. China's economy is expected to grow by 9.1 percent this year and 8.4 percent next year, according to Barclays Capital. This is quite significant when you consider that the global economy is anticipated to grow at a much slower pace of 3.7 percent in 2011 and 2012. While our investment team continues to closely monitor China's economic health, it appears that the companies in the country still have some room to grow.